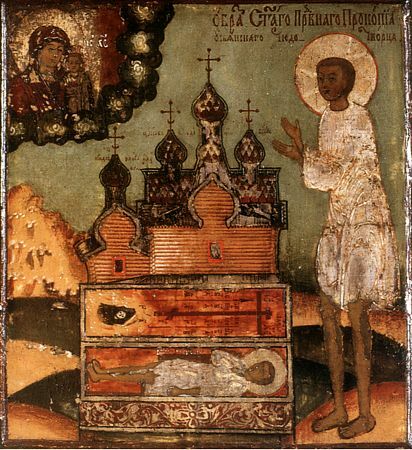 Righteous Prokopii of Ust'yansk (XVII): The undecayed relics of Righteous Prokopii were uncovered during the XVII Century near the Ust'yansk parish Entry of the Mother of God church in Vologda diocese and placed in the church, where over the course of two hundred years they remained in open view, a source of numerous healings. About the origin and life of the holy saint of God no account has been preserved. His name became known when he himself revealed it in a vision to a pious local inhabitant named Savela. In connection with an increase in the number of miraculous healings, the relics of Righteous Prokopii were inspected in 1696 (or 1645) and in 1739, after which in honour of the saint there was consecrated a chapel in the church wherein rested his relics, and his icon was written and a service compiled to him. In 1818 there was established the generally observed feastday in memory of the saint.